"There's a time for giving back"
Helping their community is second nature to the owners of The Glenbridge. 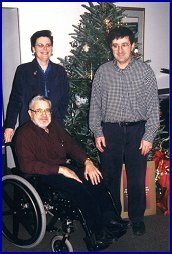 In 1998, the co-owners Larry Browne and Ron Girouard of The Glenbridge, a local fine dining establishment contacted Prince Edward Community Care and offered to place a Memory Tree in their dining room throughout the Christmas Season. Patrons can contribute any amount and place an ornament on the tree in memory of a loved one. At the end of the season, Larry and Ron matched the $399 that was raised and made an $800 donation to Community Care. In 1999 $600 was raised with Larry & Ron matching it to bring the total to $1,200. The total donation in 2000 was $1,530 which included $765 contributed by the owners. Continuing their support of seniors in this County, The Glenbridge was the location for Prince Edward Community Care's 2001 Auction and the owners helped with promotion and ticket sales, as well as providing a gala dinner at an excellent price so that the fundraising event was a success. The Glenbridge owners quietly assist many local groups including: Prince Edward Children's Aid Society, Picton Santa Claus Parade, Picton Fair, Prince Edward Arts Council, The Regent Theatre, they sponsor a ball team and for almost 3 years the pop cans from their restaurant have been picked up by a group that sends the money raised to a church in a third world country. Fine County Fare on Bridge Street in Picton. Larry Browne says "there's a time for giving back and that's where we are". The owners of the Glenbridge say that they "do small things where we think that we can make a difference." Howard Johnston, chair of Community Care's board says that "the help that we have received from The Glenbridge is certainly no 'small thing'. Larry and Ron's contribution to our fundraising initiatives helps us to continue to help seniors stay living in their own homes in this County." Prince Edward Community Care provides community support services to seniors in Prince Edward County. The agency is partially funded by the Ontario Ministry of Health and Long-Term Care. The rest of the budget is realized through fundraising and donations. The office is located in The Armoury, 206 Main Street, in Picton.